Most men find buying razors to be both a costly and time consuming chore. Standing in the aisle trying to compare prices and knowing, inevitably, you’ll be purchasing the same product again in only a few days is infuriating. 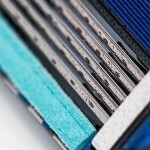 Why is it that such a simple product can end up costing consumers just over $100 a year for disposable razors? For those that choose to wear their furry faces proudly we salute you, but for others, shaving is a necessary evil. If you’re really price conscious and dedicated you could waste time scouring Amazon hoping to score the best deals. But in the grand scheme of things, purchasing a razor is the last thing you want to think about. Instead of driving yourself crazy, try a few simple tricks to get your razors to last well past their expiration date. Razors dull when water is left on the blades. Oxidation causes corrosion and chipping which in turn snags the hair on your face instead of cleanly slicing through it. After shaving, a razor is usually given a quick rinse, a brusque shake, and placed back into a drawer or cabinet but ironically, the humid and often damp bathroom is the last place you want to store your blades. Using a blow dryer on your razor can help ensure a dry blade when you finish shaving. You could also blot on a towel if you’re in a pinch. While keeping your razor dry will help to extend the life of the blade, you could take it a step further and coat it to keep oxidation and corrosion from happening in the first place. 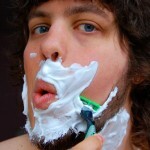 Some men have found that dipping their razors in rubbing alcohol helps to both dry the blades, and also sterilize them. In the same respect, you could also use white vinegar, as it will eliminate mineral build up. Or if you’re really feeling fancy, try purchasing some barbicide which is anti-rust and also helps to sterilize. Soaking you razors in different oils is another useful way to prolong its life, as oil will repel water. However, I would caution those with sensitive or acne prone skin, as you never know how your skin will react with different oils. Always check with a dermatologist or try using oils on a small area of skin first to see if you have any negative reaction. If you’re worried about using oil on your razor you could find a beard or stubble oil instead which could help to soften facial hair and prepare it for shaving. Though shaving creams are widely available, double check your ingredients. Products containing natural oils and ingredients you can pronounce are often better than the everyday cheaper shaving creams. In fact, some argue that the acid content in most shaving creams can actually worsen your blades over time. Keeping a sharp blade will also help extend its life. To do this frugally, try using an old pair of jeans and run the razor along the leg 20 times in each direction. The cross fibers in the jeans not only help to keep the razor sharp, but can also help to dry it. With these tips and tricks you could get your blades to last up to a year.